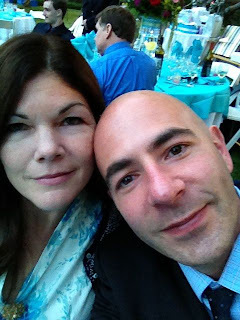 If You Go to Your Cousin's Wedding by Bob Rosenberg - . "If you go to your cousin's wedding your parents, mostly your mom, is going to make you wear dress up clothes: pants with dark socks and shiny shoes and a button shirt. There is another part you have to wear and that is a tie. The week before, you can clip the tie on to your t-shirts and wear it around the house for practice but when you wear it it's still kind of choking you a little, but don't worry, it's just pretend not real choking. Everyone is dressed up at the wedding, even your cousin Harry, not just you. Your dad also wears a tie and everything." "There's the wedding part where your cousin wears a big white dress and does the marrying. There is Hebrew singing, Hebrew's another language, and everyone claps at the kissing part. "There's two super fun parts at the wedding. 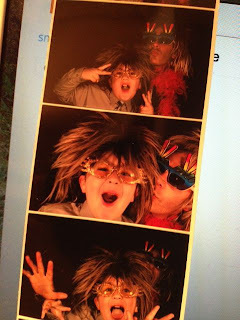 There's a photo booth where you can wear hats and sunglasses and be a rockstar with your dad." "Also there is a Michael Jackson impersonator who does singing to the Thriller song and everything. Your dad will take a picture with him and it will be so cool." "You get to have orange juice with ice from a bar and bread rolls with your chicken dinner. 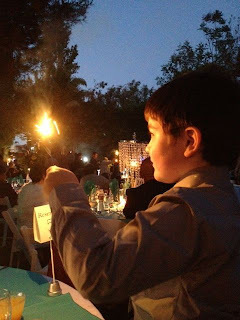 There are sparkler sticks and you can hold one. It's all super good and it's a long walk back to the car and you will definitely fall asleep in the car on the way home. Definitely." 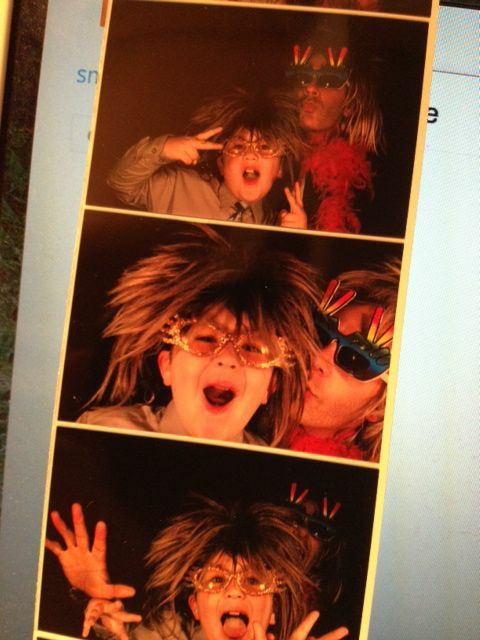 I'm now dying to know why a Michael Jackson impersonator was at the wedding. Do tell. Odd that. But what can I say? I've been hired to do exhibition square dancing at a wedding before. And once my friend was hired to play the bagpipes at a Polish wedding. Go figure. Do I love this? I LOVE ALL THINGS told by a child's experience. It can't be beat. They are MAGIC in their retelling and their interpretation. Thanks for making me smile today. And every day. Oh, I love these photos! This looks like the most fun wedding ever... Cheers! I like the pretend choking part. This is my favorite post so far... but I'm new here. Bob has a gift and rocks at photo booth posing.